The first--and best--of the 1970s "disaster movies," The Poseidon Adventure has aged well over the years. I sometimes think it gets lumped in with its disaster brethren--The Towering Inferno, Earthquake, etc.--which is a shame, because Poseidon is a superior film that established the formula for those lesser efforts. The first half-hour is basically an introduction to the people aboard the S.S. Poseidon, an outdated cruise ship making its final voyage from Athens to New York. The passengers and ship staff include: a police detective and his former-prostitute wife (Ernest Borgnine and Stella Stevens); a retired couple (Jack Albertson and Shelley Winters) going to see their grandson for the first time; a teen girl and her obnoxious younger brother (Pamela Sue Martin and Eric Shea); a lonely businessman (Red Buttons); a singer (Carol Lynley); a bartender (Roddy McDowall); and an unorthodox priest (Gene Hackman), whose defiance of his church superiors has resulted in his banishment to a third-world country (a mission that the priest embraces). Granted, some of these characters border initially on stereotypes, which is surprising considering that Stirling Silliphant (In the Heat of the Night, Route 66) co-wrote the screenplay. However, as the film progresses, Silliphant reveals hidden depths to some of the passengers. Gene Hackman and Pamela Sue Martin.. 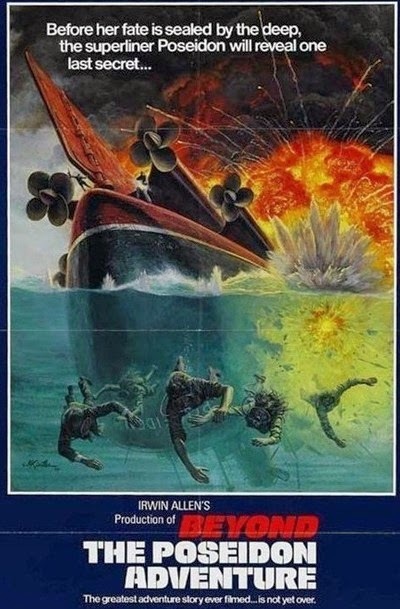 The plot cranks into high gear when the ship capsizes after being hit with an aftershock (8.6 on the Richter scale) from an underwater earthquake. With several people already dead, the survivors face their first dilemma. Two of them (Buttons and Hackman) propose that they make their way upward to the propeller shaft where the hull may be thin enough to reach the surface. However, the ship's purser encourages the passengers to remain in the ballroom, with promises that help must surely be on its way. Unable to reach agreement, two groups split off with one following the decisive priest and the other remaining with the purser. Borgnine as the detective Rogo. As the first group of passengers makes its way slowly up to the hull, friction quickly develops between the priest and the detective. In addition to having doubts about the priest's course of action, Borgnine's detective--a man typically in charge--bristles at taking orders from someone else. And it doesn't help that his wife seems to have complete confidence in Hackman's priest. This intra-group turbulence heightens the suspense as the survivors face one seemingly insurmountable hurdle after another. The interior of the ship, masterfully created by set designers William Creber and Raphael Bretton, earned an Oscar nomination for Best Art Direction-Set Decoration. Danger seems to lurk around every turn, whether it is rising water, searing flames, or boiling steam. 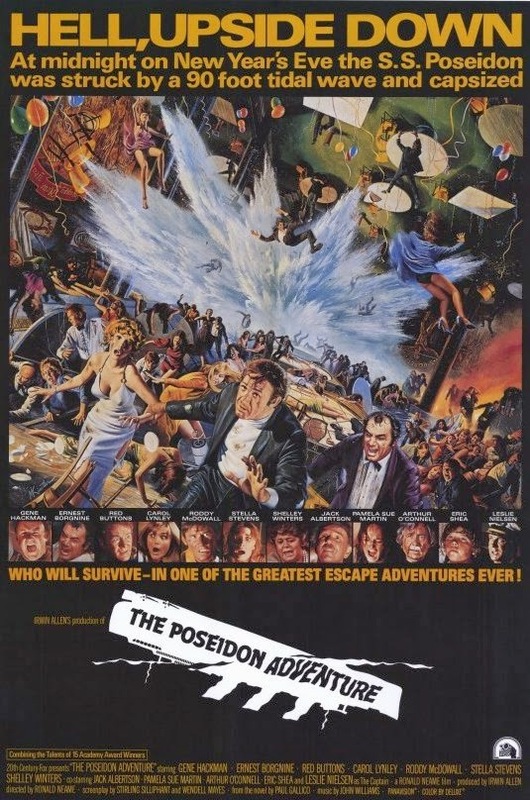 In addition to its art decoration, The Poseidon Adventure earned Oscar nominations for cinematography, costumes, sound, editing, and John Williams' excellent music score. Shelley Winters, who won the 1973 Golden Globe for Best Supporting Actress, lost the Academy Award in the same category to Eileen Heckart for Butterflies Are Free. Still, The Poseidon Adventure wasn't shut out in Oscar wins; the song "The Morning After" picked up a statuette and the film was given a "special achievements award" for its visual effects. Although Borgnine gives one of his best post-1960s performances and Winters has a great scene, acting honors go to Gene Hackman. His high-octane performance propels the film and reaffirms his status as one of the most versatile actors of his generation. Michael Caine & Sally Field. Backed by a canny marketing campaign ("Hell, upside down" and "Who will survive?" proclaimed the posters), The Poseidon Adventure was a boxoffice smash. Producer Irwin Allen copied the formula, only with bigger stars, for The Towering Inferno. And, at the end of the disaster movie cycle, he mounted an unsuccessful sequel called Beyond the Poseidon Adventure. Thirty-three years after the original film, two remakes appeared: a made-for-TV version with Rutger Hauer and 2006's Poseidon, a lively remake helmed by Wolfgang Petersen (Das Boot). Though the latter is quite watchable, I recommend sticking with the original if you're in the mood for a suspenseful movie about an overturned ocean liner. Love this film but I have a correction...the teen girl in the film is Pamela Sue Martin, aka Nancy Drew (ABC's series in the 1970s-1980s) and then she also was on Dynasty. Pamela Franklin is a British actress, was in Prime of Miss Jean Brodie, among other films. Thanks, Jenni, for catching a bad typo. The right Pamela is included now. Nowadays when I catch a few minutes of "The Poseidon Adventure" on commercial television I am immediately taken back in time and how enthralled I was seeing this for the first time in a theatre. I attended with my dad. We hadn't done anything like that in a long time. He called it "a dandy". That means four stars in anybody's book. Thanks for a reminder of the best of its class. The name under Miss Martins picture still has the name Pamela Franklin. Also it wasn't Frank Albertson it was Jack Albertson. Jack, by the way, won an Oscar, a Tony and an Emmy. Jack starred in Chico and the Man. His sister was character actress Mabel Albertson.